What is it? Turmeric is a bright yellow root that is used as a spice or seasoning. It’s typically available dried and powdered, though the fresh root is becoming more widely available as well (we get it at our regular grocery store these days!). It has a subtle flavor—warm, peppery, and a little astringent. Why is it healthy? Turmeric is considered a superfood because it contains curcumin, a compound especially good at targeting inflammation, which is tied to a wide range of ailments, from cardiovascular disease, to Alzheimer’s, to PTSD (Time magazine). It’s also cited as a potential cancer-fighter, a remedy for colds and flu, a way to soothe stomachaches and indigestion, and more. Suraj remembers his grandmother applying it to his skin as a child to treat cuts and bruises (smart lady, as turmeric is indeed an antiseptic). We use turmeric on near-daily basis in our kitchen, as it’s a staple of Indian cooking. Most curries and vegetable preparations get at least a pinch, and I also like to boil my vegetables in turmeric water (potatoes especially, as it gives them an especially vibrant color). I add a teaspoon or so to most soups and broths as well, as it has a very subtle/neutral flavor. 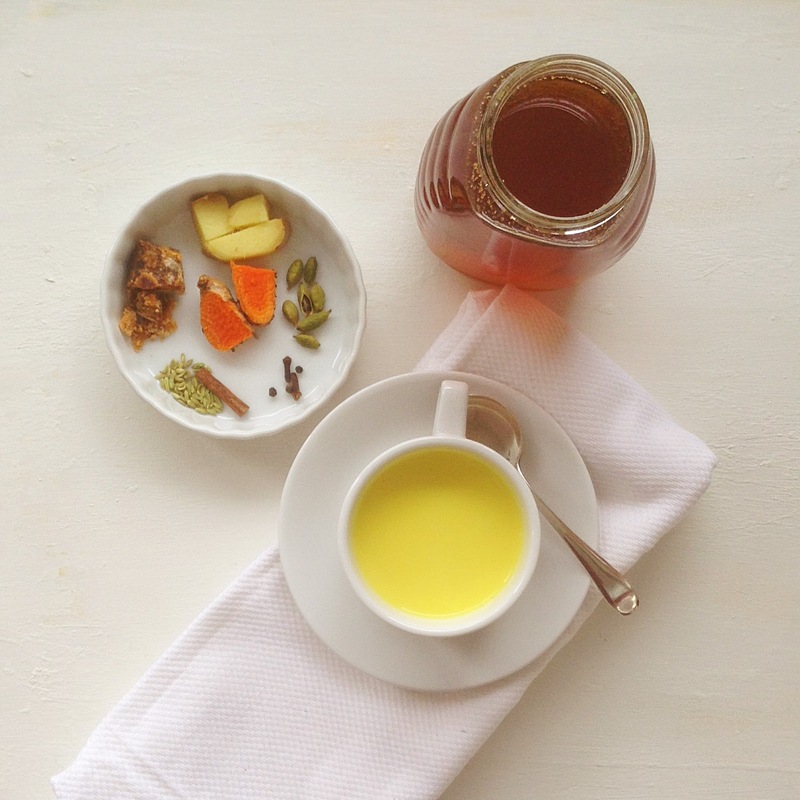 When we’re feeling under the weather, I make us this turmeric milk (also known as golden milk). Warmly spiced, creamy, and subtly sweet, it’s easy to love. We like to have a cupful after dinner, to settle the stomach/mind. It reminds me of one of those comforting foods you’d read about in a children’s book, like the three bears’ porridge, or bread & jam for Frances (anyone?). Golden milk for everyone! If you don’t drink dairy, you can substitute coconut milk. It’s great that way too. I use fresh turmeric root (as in the above photo), but powder is fine too—just stir well after adding so it doesn’t clump. Jaggery is unrefined cane sugar; it’s in the top left portion of the bowl in the photo above. 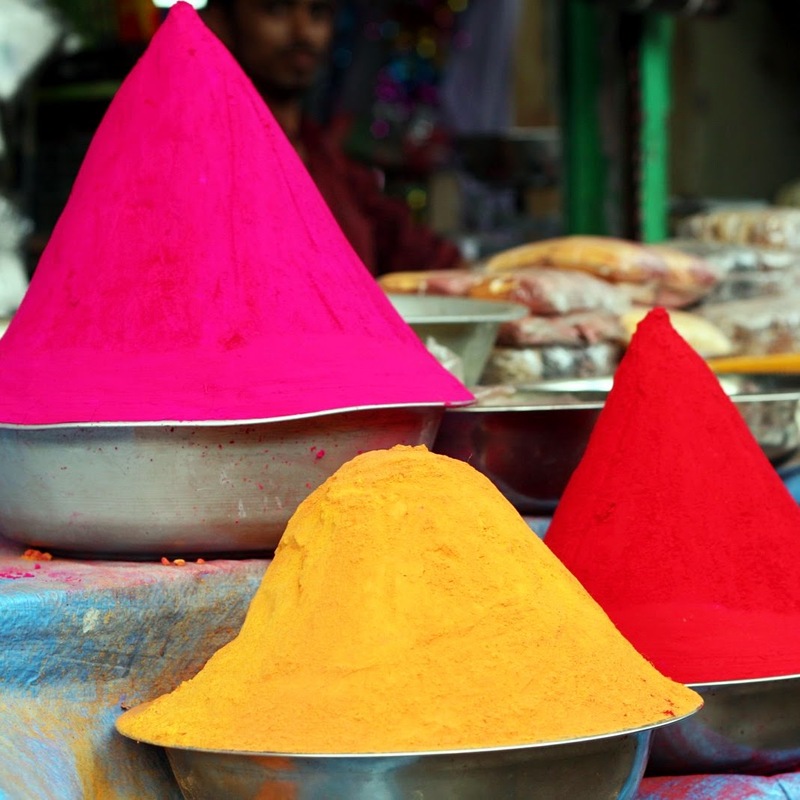 All of these items can easily be found at any Indian grocery… for much cheaper than the regular grocery store. Leave out any spices you don’t have—this recipe is certainly open to interpretation! Place all ingredients except the jaggery/honey in a small saucepan. Bring to a low simmer (be careful not to let it boil, as it can quickly bubble up and scorch) and allow to simmer for just a minute or two. Remove from heat, cover, and allow to sit for at least 10 to 20 minutes to infuse flavors. Strain, discarding spices. Add grated jaggery or honey, stirring to dissolve. Serve warm. Keeps in the fridge for about a week. Note that the color may become even more yellow over time—that’s the magic of turmeric. 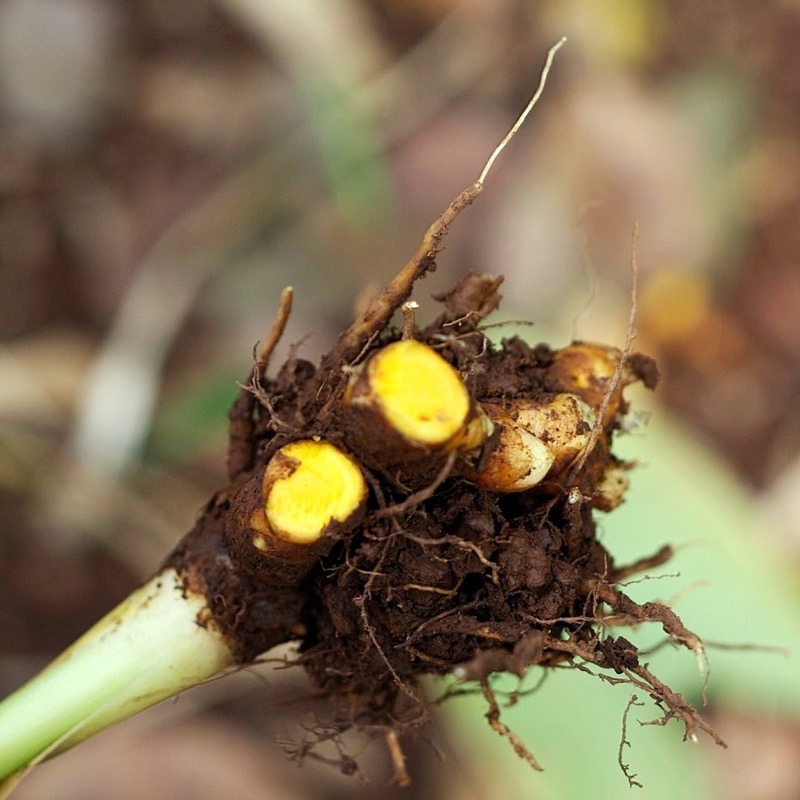 Fresh turmeric root at a spice plantation we visited in Goa, India. Turmeric powder on sale at a market in Bangalore, India. It’s used as both a food and a dye. I like to add a little turmeric to my pumpkin muffins since the flavor is so mild and I feel like it’s a little bonus healthy pinch! Oh that’s a great idea Amy! Going to try that for sure. Oh, I’m totally making your recipe now. Why have I never thought to add fennel?! You’re brilliant. And may I say again just how happy I am that you’re blogging!!!! Yes, Lindsey, we love fennel! It’s such a great spice for digestion, and flavor too. I use a combo of cinnamon, paprika and turmeric while sautéing chopped onions before adding sliced or diced pare cooked potatoes. The best home fries ever. Oh I love that combination! Trying it asap.